Interpress Printers partners with SCG Packaging and invest in flexo printing. Interpress Printers is a young company that specializes in the printing of fast-food packaging, with headquarters based in Kuala Lumpur. Interpress Printers has an outstanding reputation amongst its customers. Currently it is experiencing a large growth in its business and as a result production capacity will be expanded to its new premises in Kuala Lumpur. Strategic partnership with SCG Packaging. IPP is a member of the International Packaging Group, a global alliance of leading companies specializing in packaging printing. From 19th January 2018, SCGP Solutions (Singapore) Pte Ltd, a subsidiary of SCG Packaging has acquired a majority stake in IPP. SCG is a leading business company within the ASEAN region with a strong standing in the market. 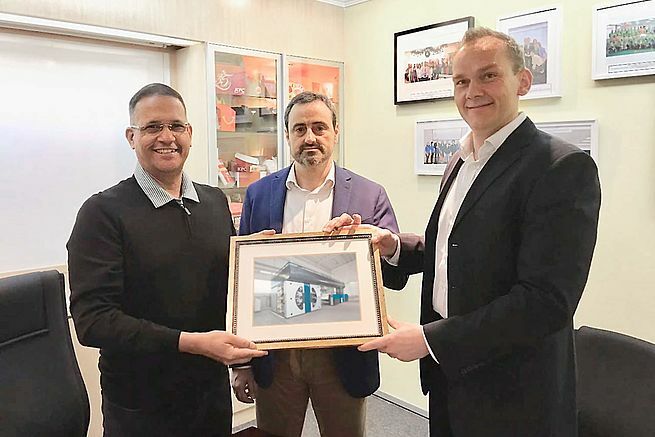 IPP’s partnership with SCG Packaging will support their vision to become a leading solution provider to support all packaging requirements for its clients. Today Flexo printing is the fastest growing packaging segment with annual growth rates of 4-5%. CEO of KBA Digital & Web and KBA-Flexotecnica says “this project is solid proof that we have arrived on the Asian market. The next step is now to further strengthen our local presence. Our quality and our local service capabilities as a globally active press manufacturer will benefit not only IPP itself, but also its customers,”. Interpress Printers now uses the state-of-the-art EVO XD that features 8 printing units, a new dryer generation and a newly developed coating unit. The EVO XD comes with a highly efficient energy-saving ventilation system in the bridge dryer, a full automatic impression control system and an operator-friendly register setting system.